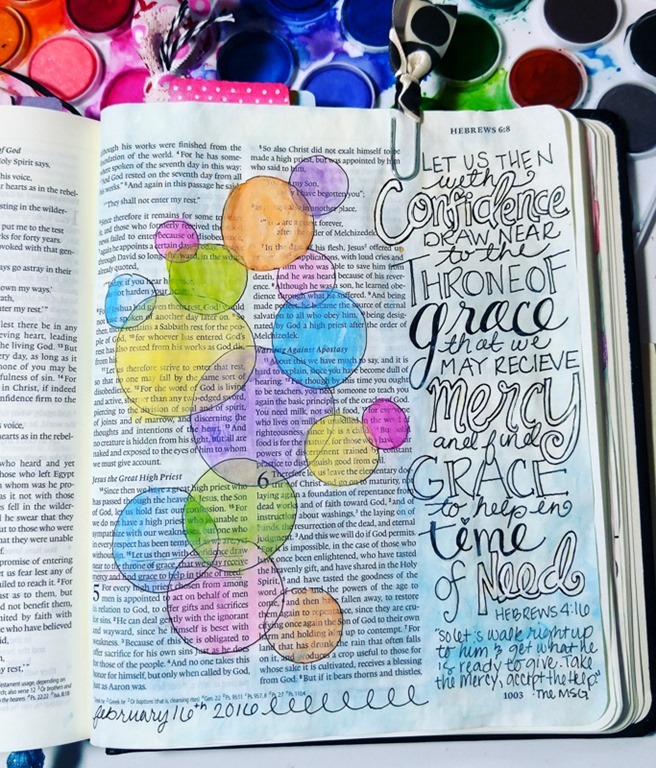 Essentially, the idea is that you write/draw/paint express yourself directly on to the pages of your bible – but I would definitely recommend you google “bible journaling” or “illustrated faith” if you want to read more about it. 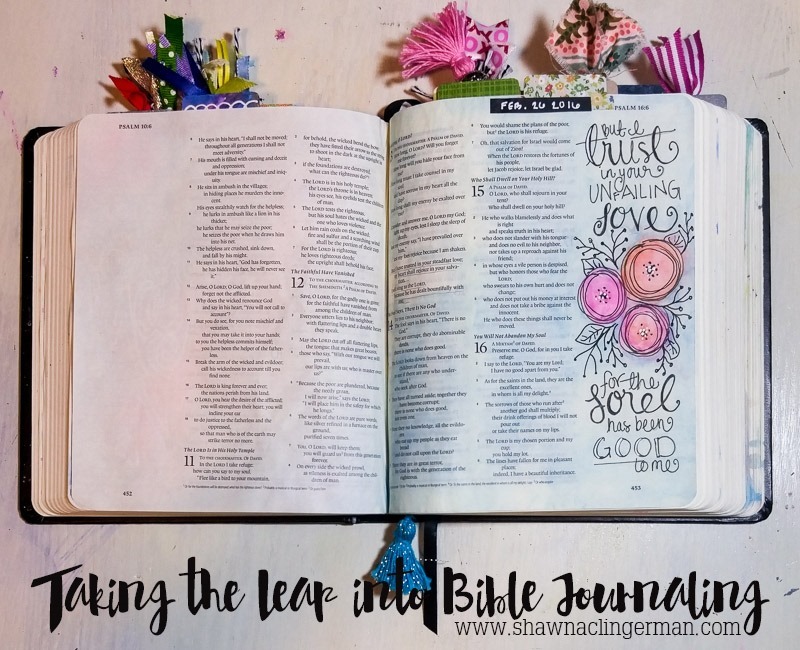 Since starting my own journaling bible I have had SO much interest on my Facebook and Instagram that I thought I’d take a post here to explain what I know about it, how I go about it, and give people a little step by step through my own way of doing things. This could be a bit on the long side, but I’m hoping my experience might help you take that step if it is something you’ve been thinking about – or at least just explain a little bit more about it to those of you that are curious! 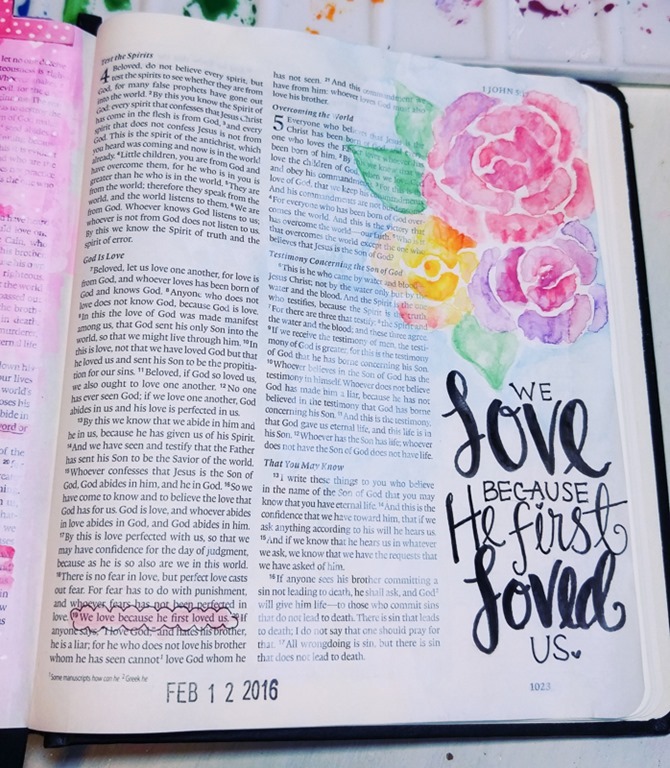 It was just over a month ago that I took the leap into the world of bible journaling and I have to tell you, it has been SO amazing. For a while now I’ve been art journaling, and this has been my year of growing in all things ART. 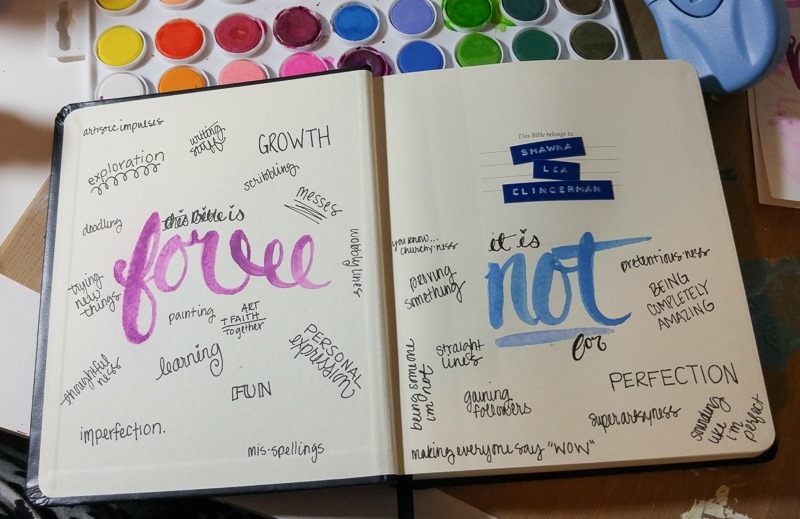 I have also recently gotten really excited about lettering making pretty words, and honestly I was sort of drawing a blank 70% of the time when I sat down to “letter” or paint something… All the while I kept seeing this AMAZING stuff online where people were doing those things in their bibles, and using the scripture as a jumping off point…. add to that the fact that I really wanted to start being more consistent about reading the bible daily, and I was looking for a way to really connect with that – It just seemed to all point me toward one thing – so I decided to take the leap and JUST GET STARTED. I decided the best way to get started was to just JUMP in! So I hopped on Amazon and went looking for basically the most affordable journaling bible I could find. 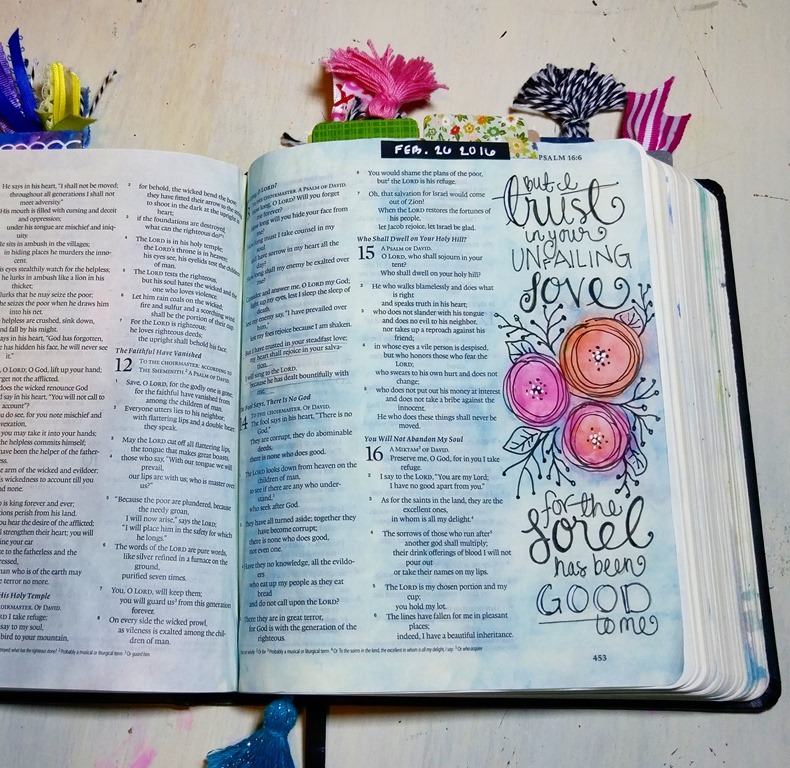 What exactly is a journaling bible you say? 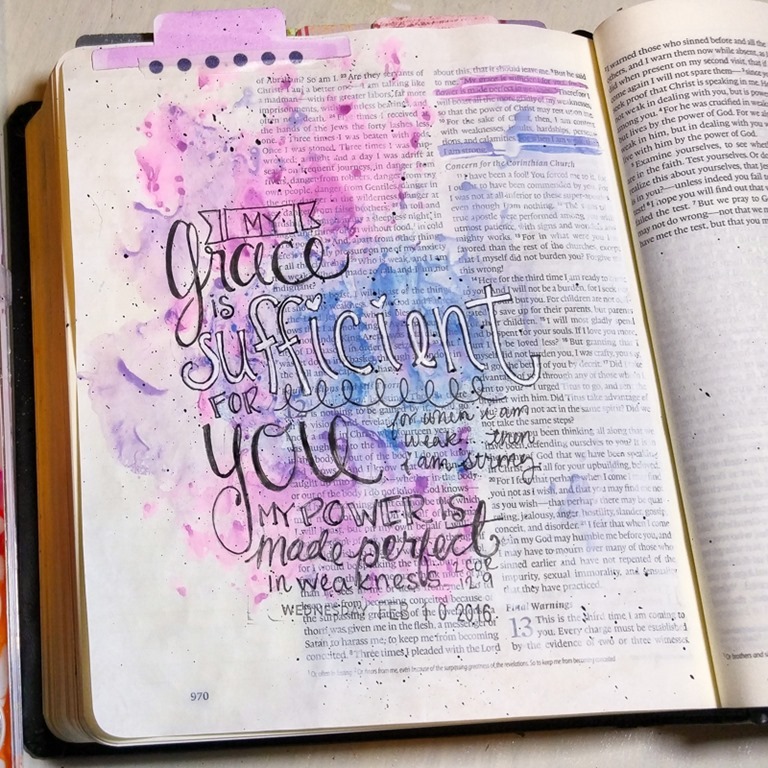 Well let me show you – there are several versions of bibles out there for journaling in, and some even specifically for art journaling – but when it comes down to it, any bible with space in the margin will suffice. 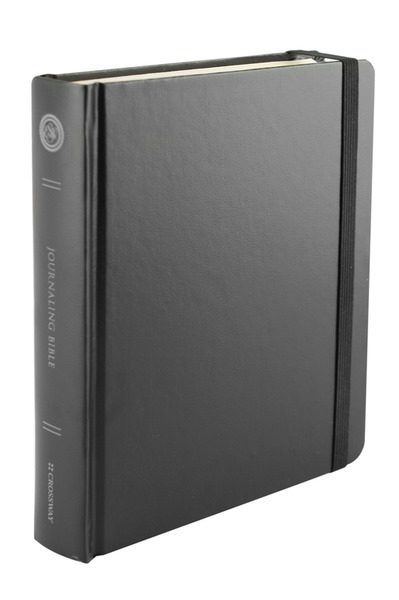 This is the bible I ended up getting – it is the ESV Double Column journaling bible by Crossways. A lot of bible journalers are big fans of the single column bible, and I went back and forth on which to get, but in the end I went double for a few reasons – First, it is a little easier to read for me, with a tiny 7.5 print size, the two columns felt a little more natural to my bible reading eyes. Also, there is something visually pleasing to me about two columns of text, when I went diving into Pinterst and Instagram to seek out inspiration those were the pages that were the most beautiful to me. Finally, when I was shopping for my bible, the double column was a full 10 dollars cheaper than the single… made it easy for me to make up my mind in the end! HOWEVER looking today, the Crossways Single Column is only 19.99 (the double is 18.99!) right now on amazon, so heck, I say get what calls your name! 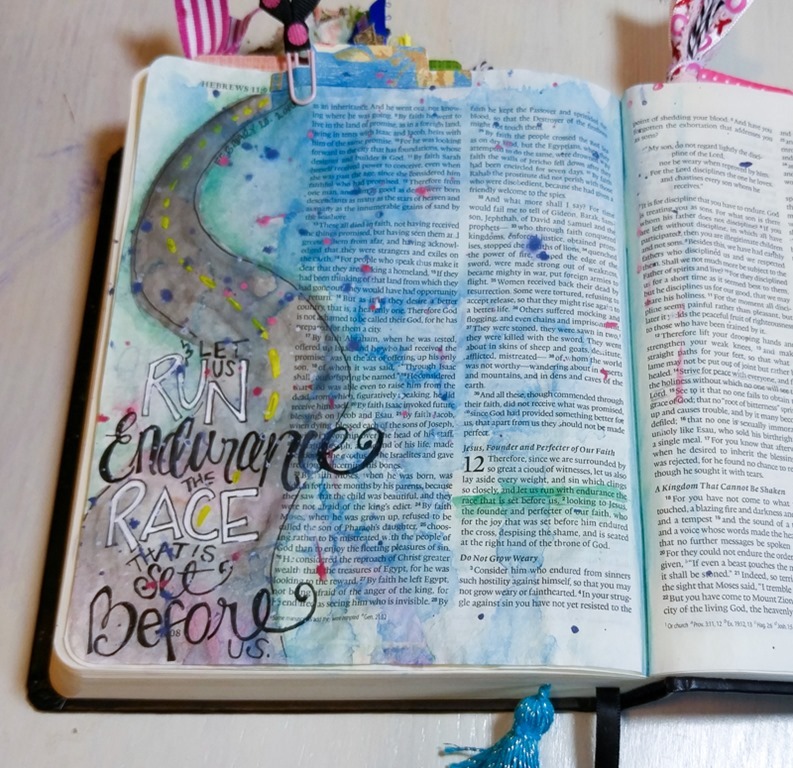 In the end I had put off this endeavor for long enough because I thought it would cost too much to get started, and so I didn’t want to let my perfect hunt for the “perfect bible” to hold me back a second longer! In hindsight, I DID find the perfect bible for me, because it got me going! and for under 20 bucks, I really can’t believe I put it off so long! 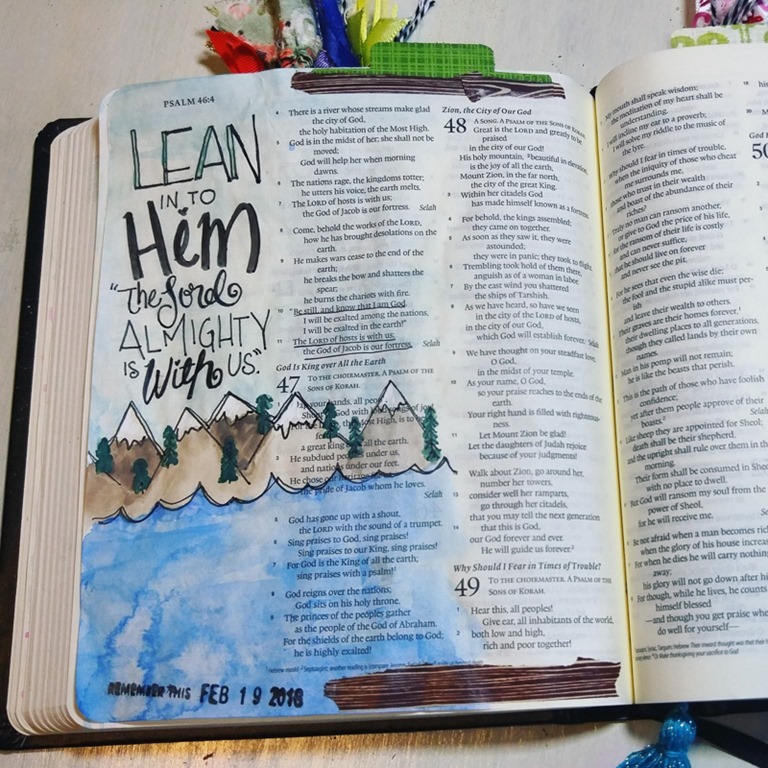 If you want to have LOTS of space, look for something called an “interleaved” bible which has a blank sheet every other page – LOADS of room for creativity and notes, eventually that may be on my “to get” list, but for now, I’m so happy with my lovely little journaling bible I bought! I seriously LOVE it. As far as other supplies you “need” you will want a set of pens that are have a pigment based ink – if you are already a doodler like I am, then you probably have a set of microns (or have been eyeballing some). They have been the perfect choice for me, they don’t bleed through the page all that much and they are so smooth writing on those creamy bible pages! If you are buying something new look for a really fine point – I use my size 1 and 2 microns the most, even though when doodling in a sketchbook those are usually a bit small for my tastes. A lot of people get the Uniball Signo pens to use – they are like a gel pen and will stay on their side of the page fairly well too. If you want to paint or color, than obviously you will want something to do that with – I already had a cheap set of watercolor paints that I’ve been using for art journaling and they have been awesome! 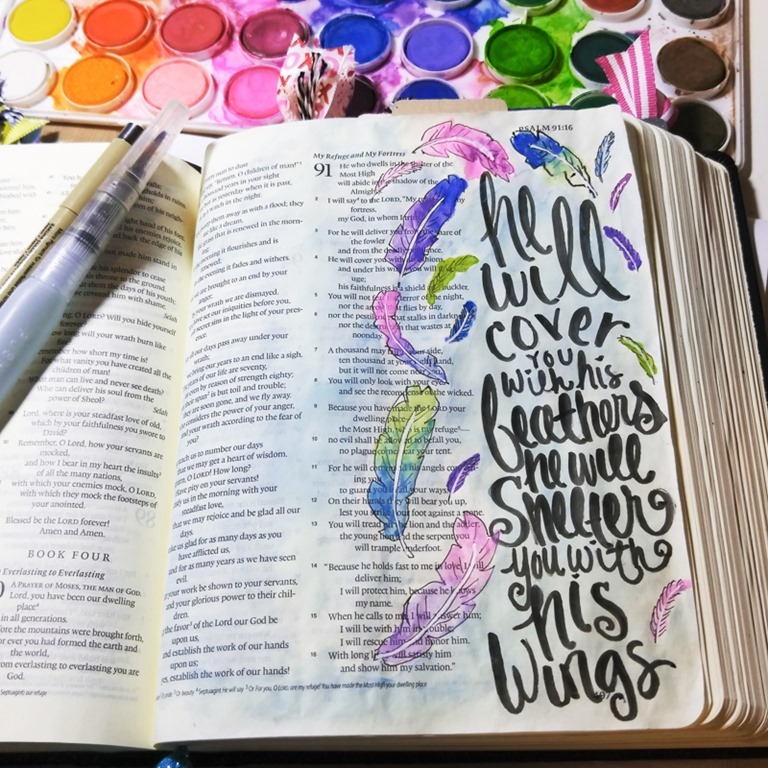 If you aren’t a painty type of person, there are lots of other options, I recently bought a set of colored microns and some gel highlighters as a gift for a friend that I wasn’t sure how artsy she would want to go with her new bible, and there is always the option of getting some quality colored pencils. I really would encourage you to just find a pigment pen and then use what you already have when you get started – then you can see what you find yourself drawn to and go from there. If you really want to go crazy, oh my gosh there is SO MUCH out there to use, and if you are a stamp person I can’t tell you HOW COOL all the stuff from Illustrated Faith looks! Their Created to Create kit is way up there on my list, I want to do that devotional so bad! But the thing is, I didn’t want to let myself get held back by the need to afford this that and the other thing – the truth is, if you have a bible and a pen, you can get started! The big question EVERYONE asks, is DOESN’T IT BLEED THROUGH???!! Or the related question of – do you “prime your pages”?! 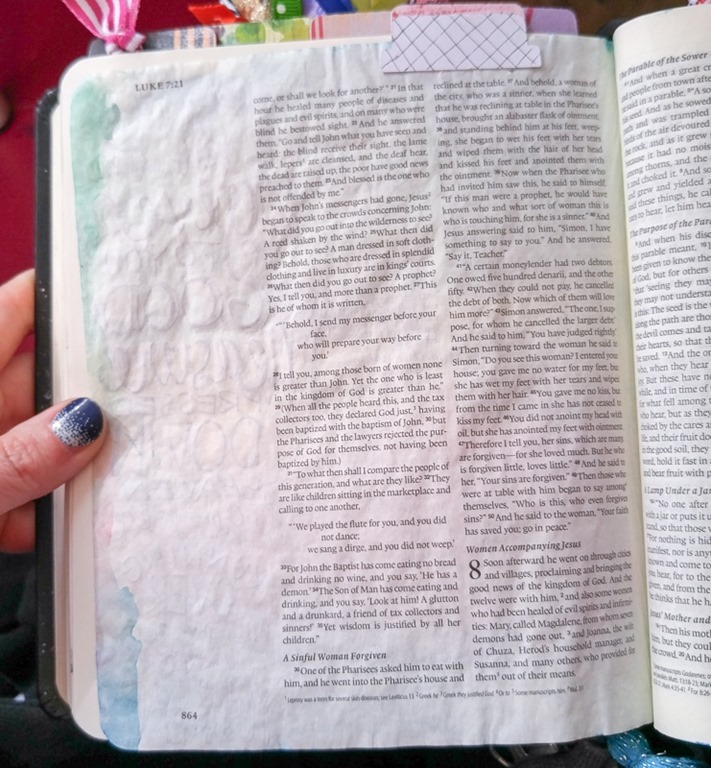 Well, when I got my bible, I already had a big tub of white gesso that I’ve been using on my art journal pages, so it was easy to just put that down, usually right after I read a passage and before I start journaling. 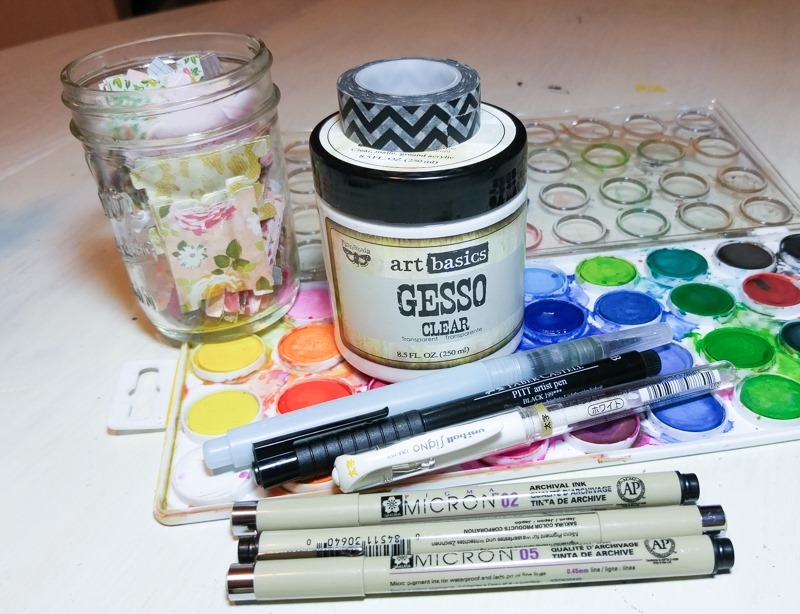 I was totally fine with how it behaved with the page, however, I did end up buying this Art Basics Clear Gesso, simply because the white making my paint cloudy sometimes, and covering my words more than I would have liked. That being said I know of a LOT of bible journalers that do not put any base coat down on their pages and even use loads of watery watercolor right over the untreated pages – it looks great and doesn’t end up showing too bad on the other side – I just like gesso and like the extra coat of protection so that is my way of doing it. The other day I went CRAZY with the watercolor on my page, like SO much color, and it is amazing to me how little it went through, actually the only seepage is really from the drips that came over the side of the page, and I was in a little too much of a creative frenzy to stop it before it got on the other pages – but oh well! For me this is not a matter of making a pristine work of art, it is about experimentation and learning and play – and so it is all part of the process – plus my watercolor edged pages are kinda cool now! Not too bad right?? That will be easy to paint over/work with when I want to do something on that page! And look at how little you see of that bold color from the other side! So cool! Ok so this is not going to be the same for everyone, but here is pretty much the way I go about working on a page from start to finish. 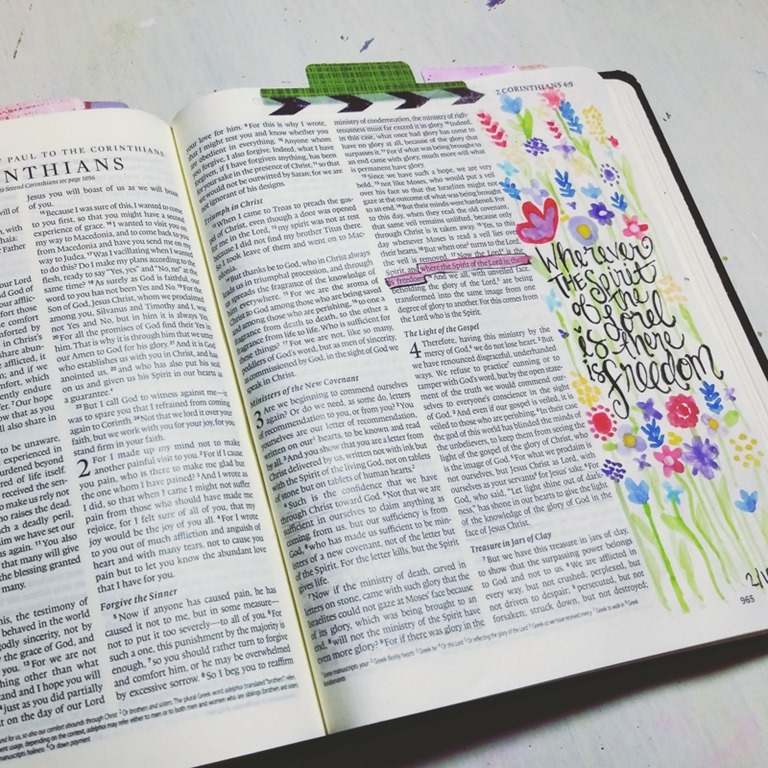 I generally start by reading whatever devotional I’m doing right now – part of the goal with this was to motivate me to read the scripture more and so when I get up and do my bible reading the art is just part of it now most days. Right now we have a bible reading guide we are doing with the church, so I’m following that. 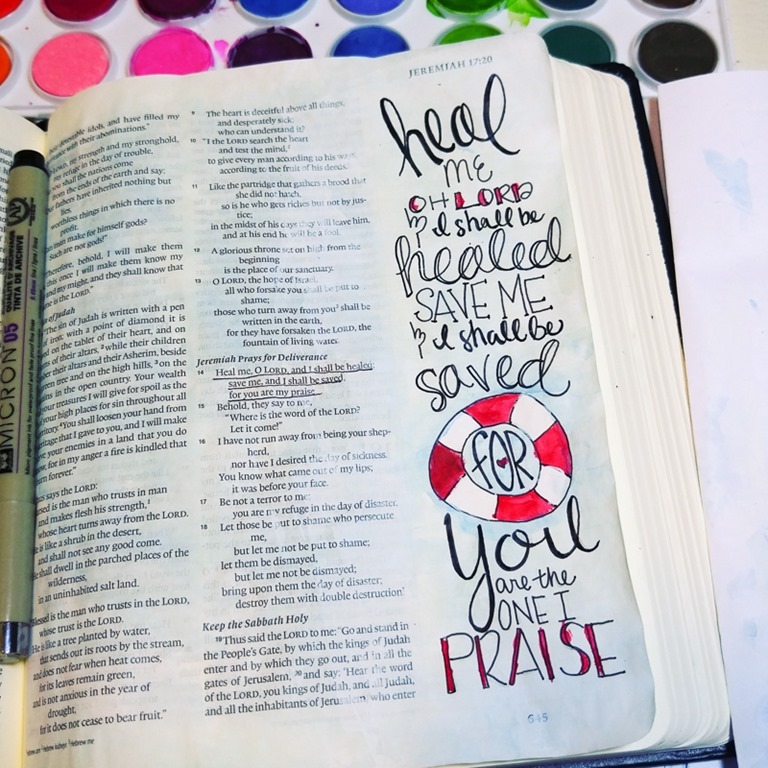 As I read, if there is a verse that jumps out at me, I’ll just lightly underline with a pencil – usually by the end of reading, I have something in mind that I want to write out in the margin of my bible. 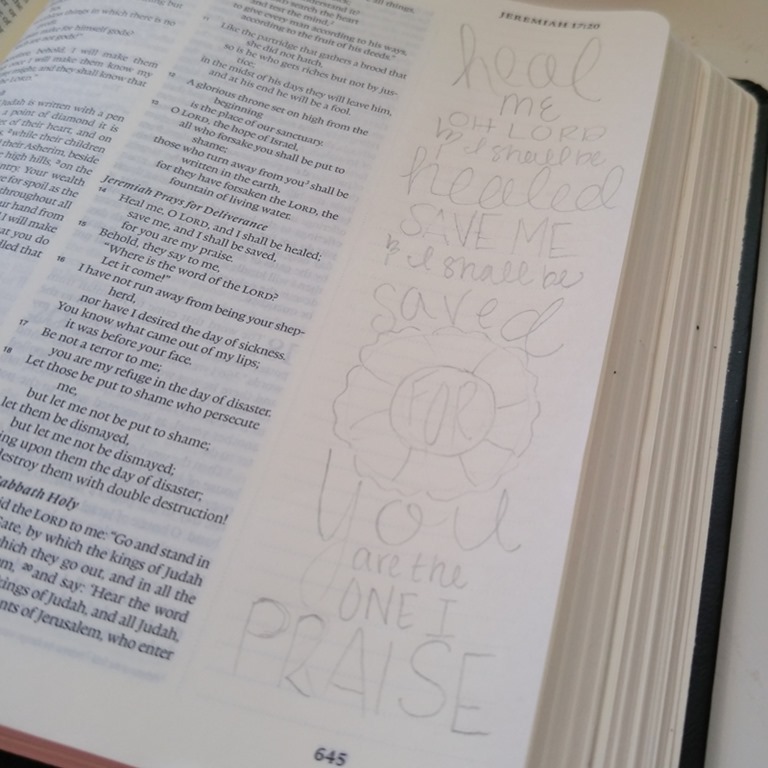 Sometimes there isn’t a verse that really speaks to me, but that is ok, because I can always just open to Psalms and find something, or I’ll do some googling if there is a specific theme in my heart I really want to work through (like peace, or comfort or something like that). As soon as I have a verse in mind, I’ll pencil it out on a scrap sheet of paper to get an idea of how to arrange it on the page. At this point, I cover the page in a thin coat of gesso and then use my heat tool to dry it. At this point I get out my microns and get my ink on! I find I LOVE the sizes 1 and 2 the most when I’m drawing on the super smooth bible pages. FINALLY time for COLOR! 9 times out of 10, I bring out the watercolor, so in love with that stuff! When I’m all done painting, this is when I’ll go back and re-ink a few places that seemed washed out – sometimes my page calls for a bit of white pen too and so I’ll do that on my top layer as well. Tab it/stamp it/date it/clip it. 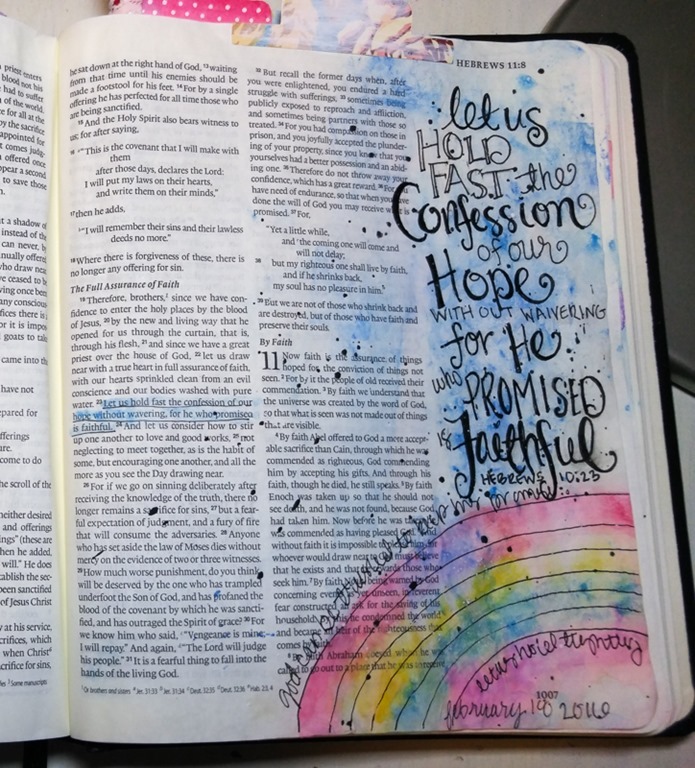 First of all, I like to either stamp with a date stamp or jot down the date with my micron when I finish my page – I think it is going to be fun to look back on my “bible journaling journey” as the bible gets more and more filled up. This also is when I usually pick out a tab or clip for the top of my page – I really quickly learned that this is a really important step for me because I NEEEEED to be able to find my pages in the future, for example every time I obsessively count how many I have so far (26 as of tonight just incase you are wondering!) 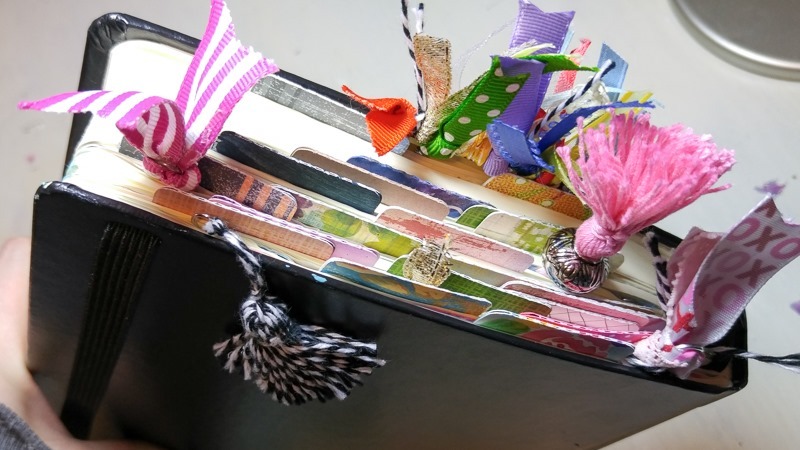 Also, I am falling in LOVE with the way my bible is looking all filled to the brim with tabs and clips! And that is the jist of it, I’m trying not to be excessive in my explaining here seeing as it would make for a MASSIVE post, but the basics are there – I’ve had a few people request a “process video” and I think I may try to make that happen, probably something sped up and not real time, however, that would involve a-setting up my camera situation at 5:15 am when I’m still not really thinking clearly, and b – figuring out how to edit said video haha – so it might be a while on that one! 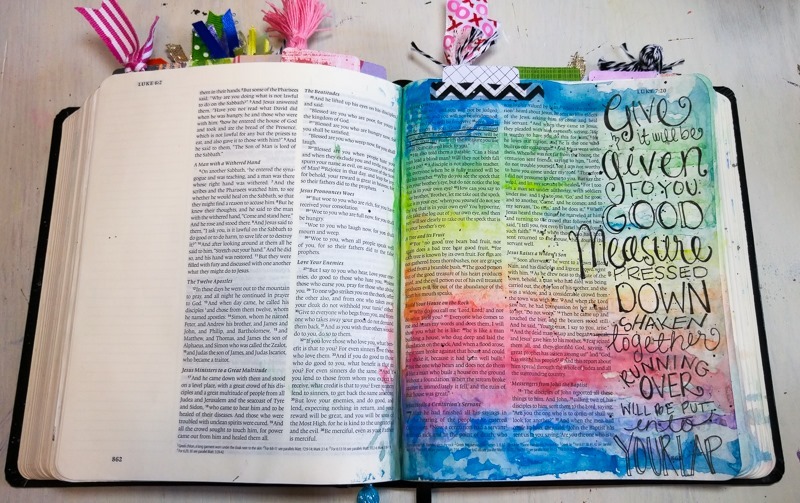 Thinking about getting started with Bible Journaling? STOP OVER THINKING IT! Note how I had that all in caps and italicized?? That’s because I really do think that is the biggest thing. We let our indecision and our questions about what to use, what to buy, does it bleed, hold us back some times, don’t let that keep you from something that you want! 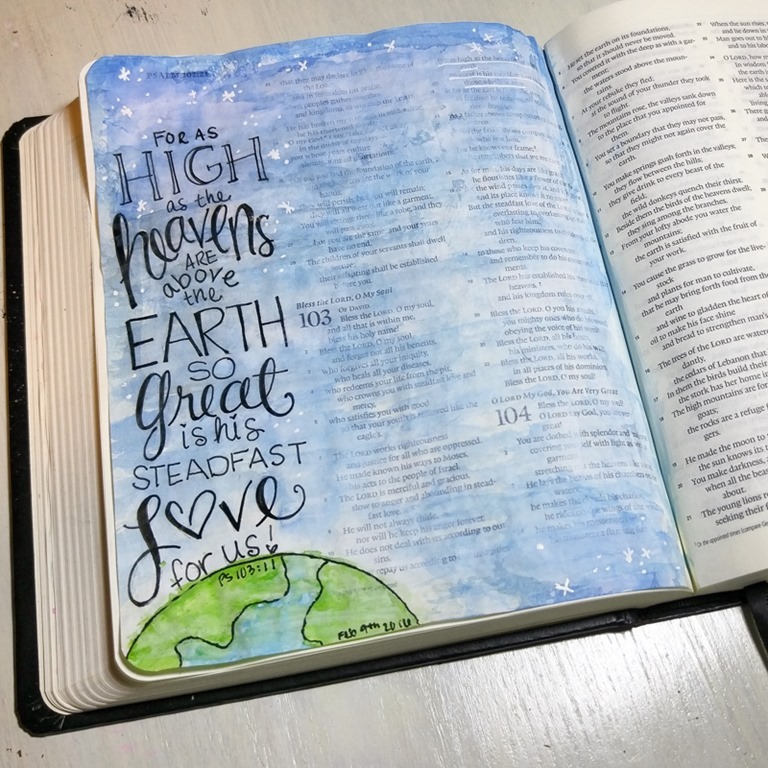 First thing to consider with getting started is that it doesn’t have to be a HUGE investment, of time or money really – hop on over to amazon and get something simple to get you started – and then when you get your bible, don’t hem and haw about what gesso to use or if you have the “perfect” verse and page plan. 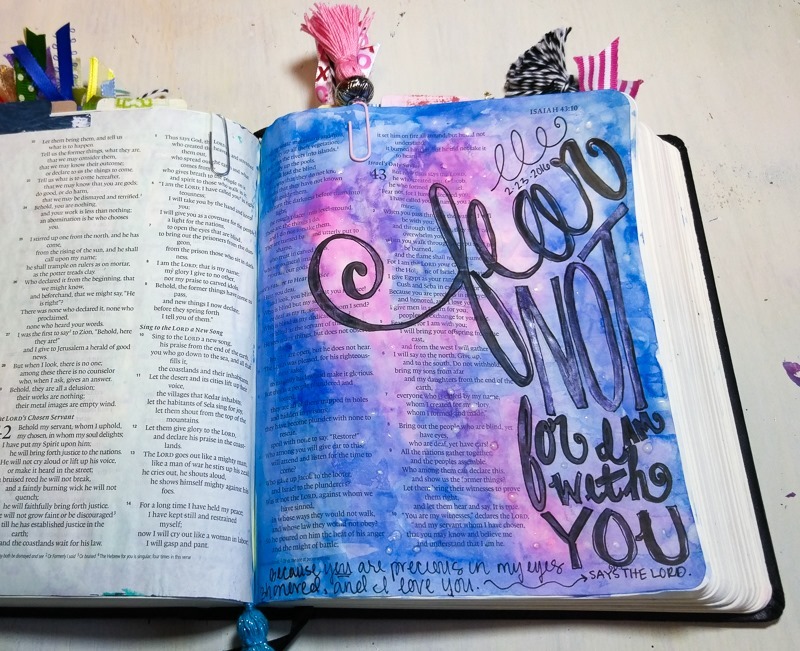 I’ll tell you what – the perfect bible, is one you are holding in your hands and taking your pen to. The perfect supplies are the ones you can grab and use right now, the ones that you feel comfortable with. The perfect page, is one you put your heart into. If you open up your heart and let go of your need to make this PERFECT you will find something truly perfect – a new connection to these awesome – soul quenching worlds, a new perspective the bible reading, and on creativity too for that matter. 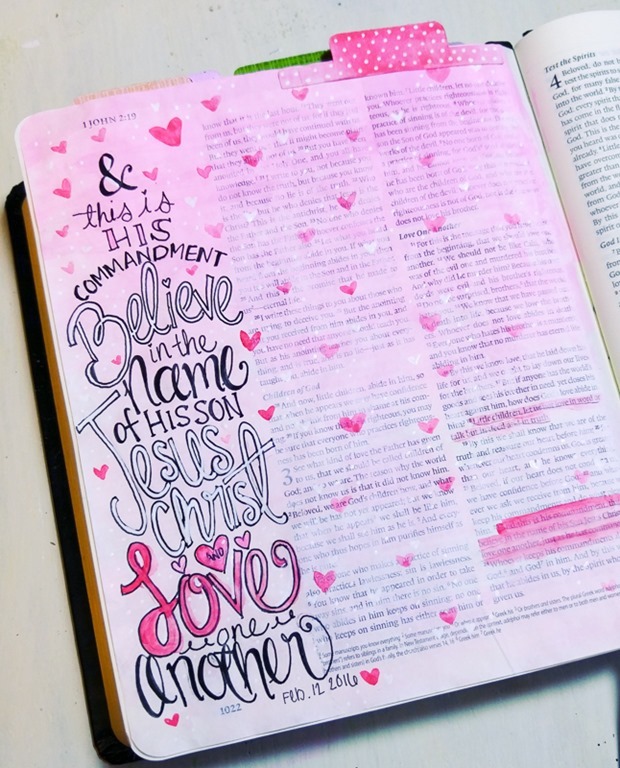 While I was waiting for my bible to come, I read this awesome blog post with the idea to do “permission pages” right in the front of your bible, sort of a way to break it in and to break your self of that timid feeling that comes along with writing in a book. So when I got my bible I put this in the very front cover right away, it was very cathartic, and as I’m learning and growing I’ve been adding more words to my “is” and “is not” pages here and there too. My paint got all goobely and it was NOT perfect which first made me go AKKKK – and then at made me go aaaaahhhh, because it is just as it should be, imperfect and honest and I really do think it got me off on the right foot. 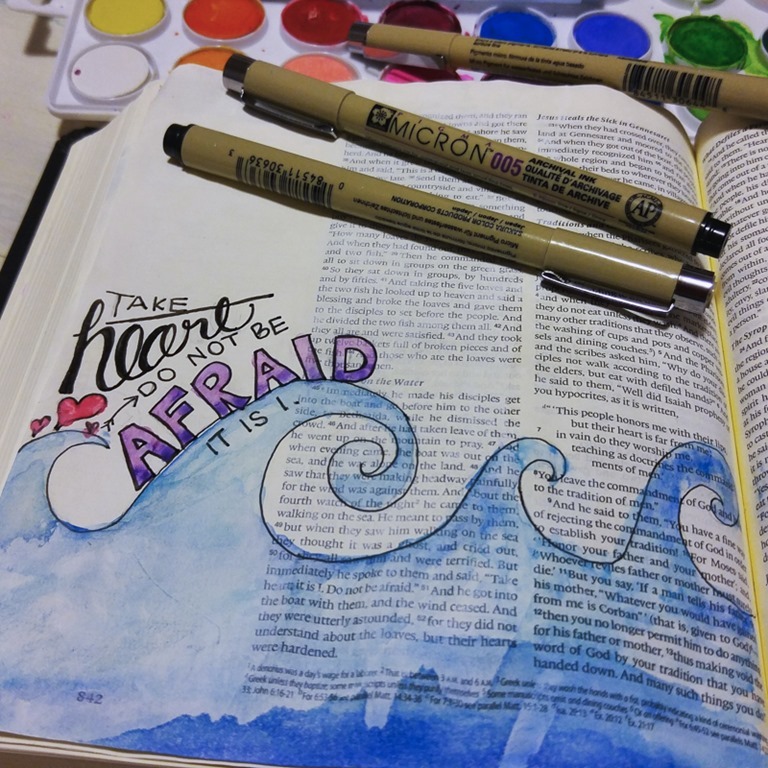 AFTER you have your bible and you’ve broken in a page or two, you can find LOADS of inspiration on pinterest, and SO many cool tutorials out there – I really love the illustrated faith site, the hashtags #biblejournaling and #illustratedfaith on instagram, and I can always find a million cool process videos on youtube. But don’t let other people’s styles/skills/techniques get in your head if it is going to hold you back, I really really REALLY encourage you to find a way of doing this that feels right to you! If you want to follow along with me, I make a new page almost every day right now, and I’m really pretty consistent about posting them on instagram, so feel free to follow me to see what happens in my bible next! I’ll come right out and tell you, my posts aren’t usually going to be like filled with a message (or sermon-like), actually the opposite – for me I’m finding the beauty of this whole process in the fact that I’m getting out of my head, and turning this thinking/word based bible reading experience, into a visual emotive based experience, for me the art of it is giving it room to sink in with out all that thinking thinking thinking – so you will probably find me letting the picture and verse speak for themselves. I sort of thought I’d be writing more words when I worked, but instead most of the time, the simple beauty in the words from the passages is all I need, the rest of it is just letting it sink in and take root. You guys, this has been SUCH a beautiful, meaningful, and learning thing for me – if you are at all considering trying or feeling the tug can I just tell you: DO IT! I truly hope my little post inspires you some, and that even though not all of you may not feel like painters/artists – that you DO that you do have it in you to make beautiful things (see this post if you would like my pep talk regarding that subject *wink*) and know that in God’s eyes the things we create truly are beautiful. But for now, I hope you enjoy your day, and keep your heart open to the possibilities of letting your inner artist out, and maybe even on a bible page too! Thank you for blogging this. I am about to order not one but 2 Bibles so I can do one for my mom as part of her Christmas this year. Great inspirations. Love this! 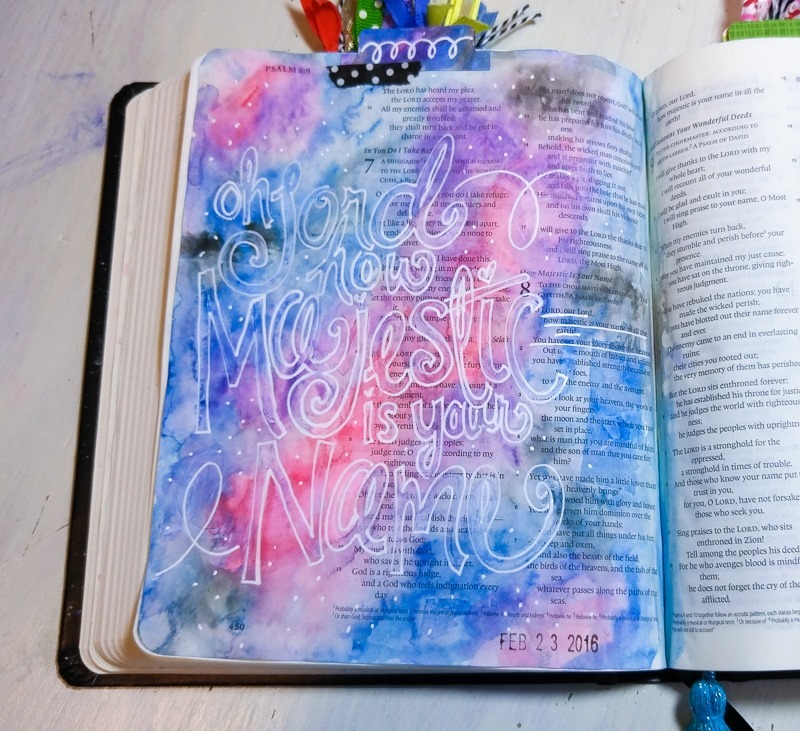 It has been so fun getting to see your excitement for Bible journaling spread!